Snow Park Goa / Blog / The Best amusement park in Goa that offers experiences worth treasuring forever. Goa is the place for the friends, families,and couples to hangout and chill there holidays. There are numerous places to visit at Goa. But the biggest question arises are what’s the best place to visit? What’s the best time to visit? What’s are the attraction destinations at Goa? These are some questions which always arises when you plan holidays at Goa. Goa is the place of beaches, resorts churches, etc. where each day is filled with memories which always reminds you of the days which you had spent at Goa. Now coming to the attraction point for adventure experience you can try the must visit places in Goa which is Snow Theme Park. It is located at the Tito’s Lane 2, Calangute – Baga Road, Baga, Bardez, Goa. This is the Goa first adventurous snow park spread around 500 Square Meters which was started in the Year 2016. The size of the theme park is like the size of a night club. There are a lot of exciting games for the kids as well as adults at the theme park. The snow at the theme park is generated artificially with the help of machines at this Theme Park. 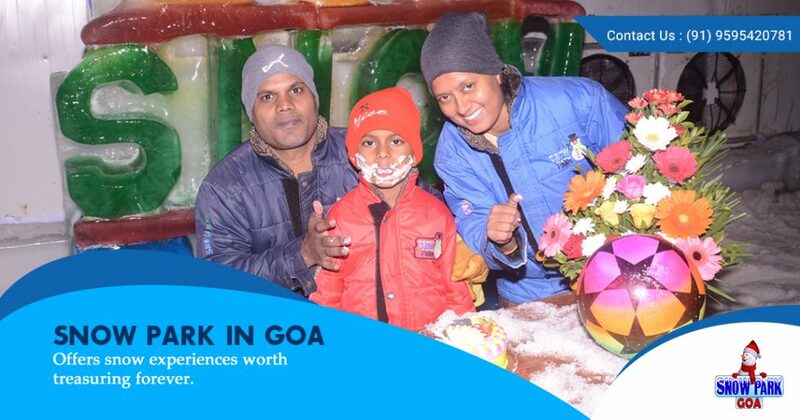 Snow Park Theme is the best attractions in Goa for the ultimate fun for families and friends to hang out. The place is covered with machine generated snow where you can have the ultimate and unique experience of cold temperature around -5 Degree Celsius. There are lots of rides for the kids to play at the park. The rides like Ice Slide is well known for the kids as well as adults at the Theme Park. If you are often looking for the place to have a shoot at Goa, you can try this place for a Pre-Wedding Shoot. As it is covered with full of snow the snowy region experience can be felt at this Theme Park. As Pre-Wedding Shoot is a culture nowadays for the Couples, you can try this place for the photo shoot to have an experience of the cold snowy region at cheap rates without travelling to the snowy areas. Planning for a Dj Party at Goa? Then try out this place for the Dj Party. You can experience a Unique Snowy Party at this place with the loud music all around at the surrounding. You can enjoy the party event with a group of people at this place with a variety of music. So go and try out this place for the ultimate Dj Snowy Party. If you are planning for a birthday party at the Goa, then you can try out this place. This place has unique drinks which are served in the Ice Glass. You can make your birthday special with a snowy region all around your place. You can try out different drinks and foods for the people to have the ultimate experience of birthday bash at this place. These are lots of other places to visit near Baga. You can try out this place instead of going to the snowy regions which take a lot of travelling there if you are staying in India. Try out this amusement Theme Park which will make a different Impact and Unique Experience people going out this place.